Sewing the Seeds utilises creativity and enterprise to break the cycle of poverty for Indian women. We are creating an environment of self determinism and economic independence for marginalised women by harnessing their local craft traditions. In partnership with grassroots NGO Samugam Trust, we've been providing sewing machines and training to rural women in Tamil Nadu since 2011. Discover some of the many success stories and learn more about the region here. Skills training provides an opportunity to create a self-sustaining income. We focus our support on gypsy women, one of the most disadvantaged communities in India. In partnership with the community we are working with their local methods of recycling to create ethically-produced artisan products to be sold on the international market. Through this social enterprise model, the women, their children and their wider communities are moving towards independence and a self-sustaining future. The local gypsy community of Tamil Nadu are the Narikuravar; the indigenous people of the area who have been discriminated against since ancient times, namely because of their nomadic lifestyle and taboo consumption of animals. The gypsy communities of India sit at the absolute bottom of society, below the caste system. Poverty, illiteracy, diseases and discrimination are the major issues that confront the Narikuravars. Girls are often married off directly after they menstruate and can become mothers as early as 14 years old. Literacy is a person's link to the world. Without the ability to read or write a women is left to endure the circumstances she is born into and is unable to change her future. Due to the high value based on boys in India the place of women as second-class citizens is reinforced. The proportion of women in the workplace in india is falling - from 37% in 2005 to 29% in 2010. 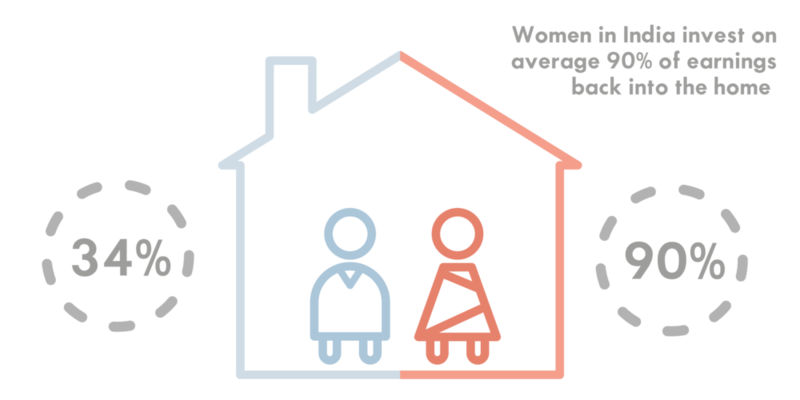 Such a large wage disparity discourages women to take control of their lives. Studies show that correcting this gender imbalance increases the prosperity of the country as a whole. Putting money in the hands of women is just smart economics. Simply handing a woman money is a short-term solution, but empowering her with skills and self-confidence is a change that can’t be undone. I am a mother, artist and teacher from Melbourne, Australia. I have developed a long and loving relationship with India and its culture since I first back-packed around the country almost 40 years ago. For the past 7 years of volunteering and working with disadvantaged communities, I realised that women's empowerment was where I could make the greatest impact. In 2011 I first met Bruno Savio. We found a shared goal and a shared passion in our desire to make a difference to the world. This was where Sewing the Seeds was born. Bruno Savio is the life force behind Samugam Trust, a small, non-profit, community-based organization, founded by his father in their local state of Tamil Nadu. Since its creation Bruno has been committed to the education and empowerment of the marginalised and underprivileged in his community. With only a few local staff and an inspiring level of commitment and hard work, Samugam now has two children's homes for disadvantaged children and supports leprosy victims and the gypsy and tribal communities of Pondicherry. I am honoured to be able to work with a man of such compassion and dedication to service. Your donation or purchase will go directly into the empowerment of gypsy women. Our aim is to create holistic change that benefits the community as a whole. After learning and prototyping with the help of local and international experts (printmakers and textile designers), the first collection of products is now available online. Each individual item is designed and made by the women, for you. Slow Fashion is the movement of designing, creating, and buying garments for quality and longevity. Slow fashion encourages slower production schedules, fair wages, lower carbon footprints, and ideally zero waste. The process of transforming and repurposing discarded, unwanted or unused waste materials into new products for better use. Fairtrade is a global movement pioneering for stable prices, ethical working conditions, sustainability and the empowerment of workers around the world. we are working to create a wholly sustainable business run by and for the underprivileged women of India.